Today was again windy. I talked Chuck into taking an excursion up the Bad River. And what a day to do it! We made it further up the river than I have ever been! We totaled 7.4 miles. We launched from the boat ramp at the mouth of the Bad River and Chuck was his usual late self. 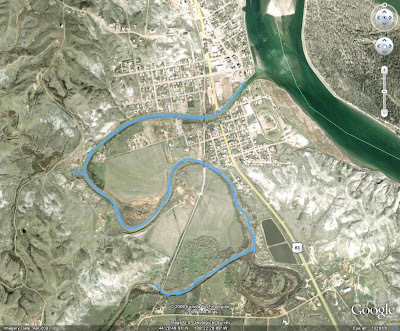 About a mile up the Bad River is a draw that has never before had enough water to paddle. Today was different. I couldn't very far up it, but I did make it around a bend. After our endeavor up the draw, a rainstorm passed over us. Nothing to bad, just added some clean water to the Bad River. Don't mind the water spots, but here is a picture of where we had to turn around. And nearing the mouth of the Bad River. That is a pedestrian bridge over the river. It is next to the boat ramp. Yesterday (Friday) I went out paddling from the causeway. It was a bit windy, so I continued around the island and played in the big waves some as I paddled downstream. Nothing to special. I wish I could take pictures while I was playing in the waves; maybe someday I will have someone stand on shore and photograph the fun. I managed to shave a bit off the distance somehow... 5.7 miles. 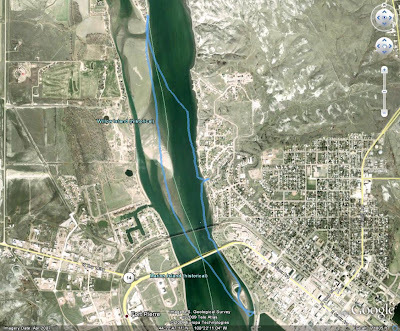 Between the Oahe Days 5k, yesterday's paddle, and two nights enjoying live bands, I was sore and tired today. This afternoon, when the sky began to clear off, I wanted to go out for a paddle. I decided to stretch out on my couch and watch a little TV first. The next thing I know it was after 5:00! I still went out and had an enjoyable cruise around La Framboise Island. The river was active with other boaters, but not too crowded. My gps read 5.8 miles for the trip length. The temperature was around 80 degrees and the wind from the E-SE at 12 mph. I didn't take too many pictures today. I kind of liked how this one turned out. Nothing spectacular, but something to show that my boat was on the water. The turn out for the first SDCA event in Pierre was low, but the fun and enjoyment factors were enormous. Just one soul, Ryan S., came up from the south eastern part of the state. We also had another Pierre paddler meet us at the put-in, Dave P. Btw, Dave paddles a skin of frame boat he built with Rick Johns. As we paddled downstream and began to get close to the edge of Pierre city limits, we saw what looked like a giant beach ball approaching us. It turns out that Chuck used his pop up sail to meet us on our way down. He departed once we got down to the causeway. Though he did help his shuttle vehicles at the end too. The temperature was in the mid 80s, but we had a SE wind ranging from 14-20 mph with gusts in the mid 20s (NOAA). The wind provided us a bit of fun coming around La Framboise. Our bows were crashing into the waves and I know at least two of the subsequent splashes came over my head! Ryan said something to the extent that this portion of the cruise was enough to make his whole trip worth it! For a reprieve from the wind, we took the channel alongside La Framboise Island. Part of the island trail system is blocked off to try to keep a pair of eagles from abandoning their nest. Well, we managed to catch a glimpse of the nest as we paddled along. I went for a paddle around La Framboise Island after work yesterday. Nothing too eventful. I took a slight;y different path. I stayed outside the little channel until just before the dike. The distance was a little shorter today, 5.7 miles. Probably due to a more direct path. A few decent scenery pictures, one pelican, a couple shots of the dike, and a couple of the river traffic. The river traffic is starting to pickup, low June temps have made it later this year than in the past. Just a reminder: SDCA event in Pierre next Saturday, June 20th. Launch from near the dam and cruise south to Farm Island. 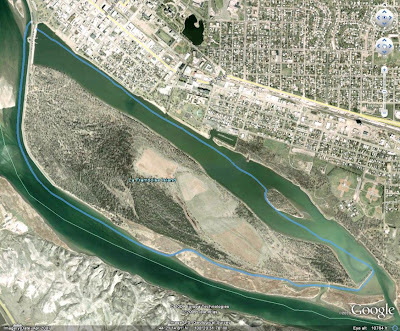 The cruise could be modified in route to include a jaunt up the Bad River and/or through the chute/channel alongside La Framboise Island. The route is 10.5 miles to the first Farm Island boat ramp. An option could be to continue another 6 miles around Farm Island, past the 2nd boat ramp, and take out along a sandy beach only a quarter mile walk from the first boat ramp. 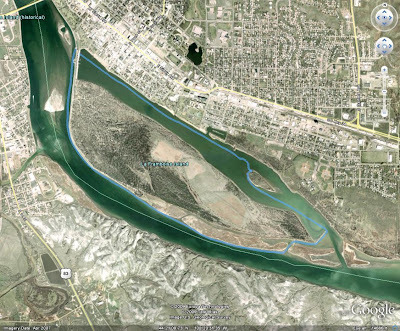 Depending on the turnout, we can adjust this plan or even go up onto Oahe instead. Note that the take-out is at Farm Island State Rec. Area, so a state park sticker is required or $6/day. Nearby Campgrounds can be found on http://www.campsd.com Oahe Downstream is the closest to the put-in and Farm Island is the take-out. Also, Griffin Park in Pierre offers free tent camping and has some camper hookups for $15/night. As for motels, there are quite a few in town. I have no idea which have the best deals. Another note, the same weekend is Oahe Days in Pierre. There will be a free concerts Friday and Saturday nights. Judd Hoos on Friday and Black Water Band on Saturday. Also, Steamboat will be having free kayak rentals on Saturday and Sunday. I am going to suggest a meet up time at 12:00 PM. I am going to be running in a 5k in the morning so much earlier won't work for me. Either the put in or take out would make a good place to meet. I'll post where to meet sometime next week. Also, my cell # is 6 0 5 2 2 2 7 4 4 7 for anyone with questions, etc. You can also email me or leave a comment on my blog. Despite the cancellation of the Missouri National Recreational Water Trail cruise, John and I decided to go down anyway. From the forecast, we thought there would be a window of opportunity. We had initially wanted to try to also go from Clay Co. Rec. Area to Mulberry Bend to fill the hole from our trip last October. But we decided to not risk the "window" any further. Also, I had a friend come up from Lincoln, NE to paddle with us. I borrowed a WS Pamlico 14 from another friend for him to use. View MR Mulberry to Bolton in a larger mapWe began by meeting at the take out, Bolton's Bend. The rain had made it a muddy mess. I could feel it pulling my pickup as I drove through it. Also, there is not much space for taking out or shuttle vehicles. Maybe postponing was a good idea if over 100 paddlers were expected. At the take out, we loaded all three boats onto my pickup and left John's Tracker behind. The gravel road that leads to Bolton's Bend was in worse shape than the above location. The drive to Mulberry Bend is 20 miles; nearly twice the length of the river cruise (11.3 miles)! The one thing that stood out about Mulberry Bend was the length of the boat ramp. I am not sure how long it is but the river could be quite a bit higher and not submerge the access area. And we were on our way. The temperature was in the mid 50s. It got breezy for a bit, but was mostly calm during the cruise. I think we had a few sprinkles initially, but didn't see any rain after that. Between the early wind and mist and the overcast sky, my early pictures turned out a little blurry. Not too much exciting to report from the early portion of the trip anyways. I found two significant places to specifically mention. 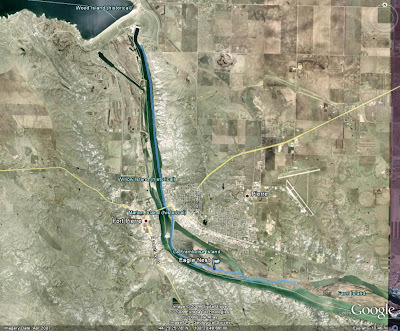 First of all, we passed the mouth of the Vermillion River. Someone has a house right at the mouth and I couldn't help but imagine the benefits to it. Not long after passing the mouth of the Vermillion we began to approach a wooded island. I have not found a name for the island though. As we approached the island, my friend, Arne, and John took the north side and I took the south end. I feel like I chose the correct side; I made a cool discovery. As I paddled along, I noticed smoke coming from the island. I thought to myself, crap, there is a fire. I wondered if I should try to call out on my vhf radio or cell phone. I kept paddling, trying to keep an eye out for the source of the smoke. Eventually, I came to a couple of guys and three kids camping on the island. They had camped on Goat Island the night before and chose their current camp site because of a structure, some sort of fishing lodge maybe, that might provide shelter if Friday night's storm got too bad. They were a friendly bunch; we BSed a bit and they even offered me a cup of coffee. But I had to go and catch up with Arne and John, so I dispensed Pirates of the Missouri stickers to all of them and headed downstream. Taking it easy... Nice view. The next SDCA event will be in Pierre on June 20. I have a couple of ideas, first from the dam down to Farm Island which is 10-16 miles depending on which end of Farm Island. 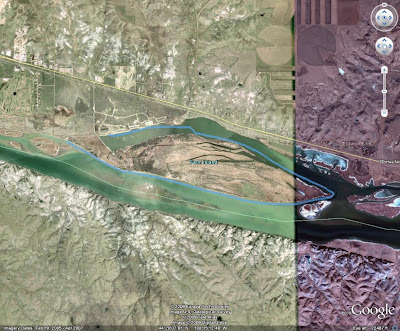 We could also try Lake Oahe. What we ultimately do will depend upon who and how many paddlers attend. If you plan to attend, leave a comment on my blog or email me; let me know if there is a specific route that interests you too. I'll decide on a route and place to meet based upon responses I get. Thanks.There are plenty of places to camp around Pierre; also, this is the same weekend as Oahe Days in Pierre. There will be live bands playing in Steamboat Park on Friday (19th) and Saturday (20th) evenings. For anyone leary of carrying their boat from the SF area to Pierre, Steamboat will have free kayak rentals for Oahe Days.Hope to see everyone on the water!